“Joseph, a Levite born in Cyprus, whom the apostles called Barnabas (which means son of encouragement), sold a field he owned, brought the money, and turned it over to the apostles” (Acts 4:36–37). This first reference in the New Testament to Barnabas introduces one whose missionary efforts would cause him to be called, like the Twelve, an apostle. As a Jew of the Dispersion, he had much in common with Paul. When Paul came to Jerusalem after his conversion, the disciples were afraid to receive him. It was Barnabas who brought Paul to the apostles, and declared to them how, on the road to Damascus, Paul had seen the Lord, and had preached boldly in the name of Jesus (Acts 9:27). Later, Barnabas, having settled in Antioch, sent for Paul to join him in leading the Christian Church in that city. Barnabas and Paul were sent by the disciples in Antioch to carry famine relief to the Church in Jerusalem. Upon their return, the Church in Antioch sent them on their first missionary journey beginning at Cyprus. At Lystra in Asia Minor, the superstitious people took them to be gods, supposing the eloquent Paul to be Mercury, the messenger of the gods, and Barnabas to be Jupiter, the chief of the gods, a testimony to the commanding presence of Barnabas. 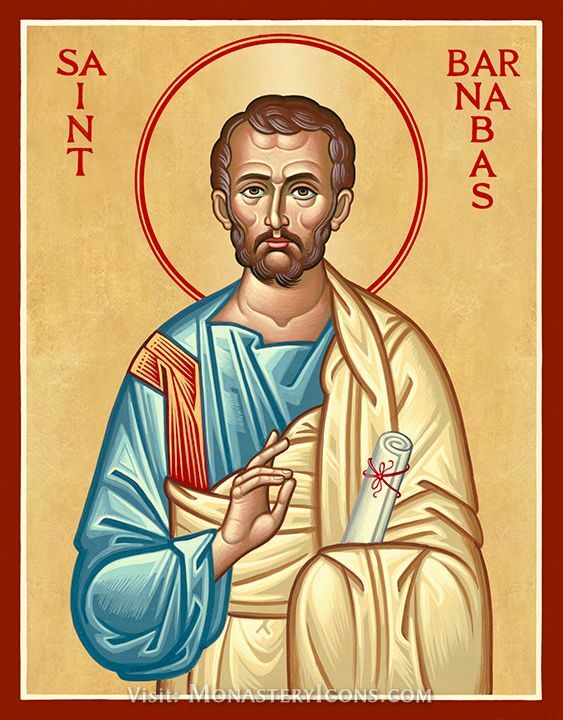 The association of Barnabas and Paul was broken, after their journey, by a disagreement about Mark, who had left the mission to return to Jerusalem. After attending the Council of Jerusalem with Barnabas, Paul made a return visit to the Churches he and Barnabas had founded in Asia Minor. Barnabas and Mark went to Cyprus, where Barnabas is traditionally honored as the founder of the Church. It seems that Barnabas continued his journeys for the Gospel, because Paul mentions him several times in his letters to the Galatians, the Corinthians, and the Colossians. He is often depicted bearded and holding a book or scroll of the Gospel of Matthew, also a Levite. He may hold an olive branch honoring his ability to make peace within the early Church. He sailed much in his ministry; he may be shown by the sea. He was martyred at Salamis, a Greek Isle, 75 C.E. His cousin and Apostle, Mark, and friends are thought to have secretly buried him. A copy of Matthew’s Gospel was with his remains after the Archbishop Anthemios had a vision leading to his lost tomb in 477 C.E. A Chapel of the St. Barnabas Monastery sits on that site.